^ a b c "RUSSIAN STATE SYMBOLS: KNOWLEDGE & FEELINGS". Russian Public Opinion Research Center. August 20, 2009. Retrieved January 27, 2015. ^ "List of Works". Virtual Museum of Aram Khachaturian. "Aram Khachaturian" International Enlightenment-Cultural Association. Retrieved December 18, 2009. ^ Константинов, С. (June 30, 2001). "Гимн — дело серьёзное". Nezavisimaya Gazeta (in Russian). ^ "National Anthem". Government of the Pridnestrovskaia Moldavskaia Respublica. Archived from the original on August 2, 2010. Retrieved July 18, 2010. ^ Резепов, Олег (December 8, 2000). Выступление Бориса Грызлова при обсуждении законопроекта о государственной символике Российской Федерации (in Russian). Retrieved December 18, 2009. ^ Eckel, Mike (April 26, 2007). "Yeltsin Laid To Rest In Elite Moscow Cemetery". KSDK NBC. Associated Press. Archived from the original on January 27, 2013. Retrieved July 28, 2010. ^ "Russians to hail their 'holy country'". CNN.com. CNN. December 30, 2000. Archived from the original on February 3, 2009. Retrieved December 20, 2009. ^ a b c "National Anthem". Russia's State Symbols. RIA Novosti. June 7, 2007. Retrieved December 20, 2009. ^ a b Zolotov, Andrei (December 1, 2000). "Russian Orthodox Church Approves as Putin Decides to Sing to a Soviet Tune". Christianity Today Magazine. Christianity Today International. Retrieved December 19, 2009. ^ "Spain: National Symbols: National Anthem". Spain Today. Government of Spain. Retrieved December 19, 2009. ^ "Himna Bosne i Hercegovine" (in Bosnian). Ministarstvo vanjskih poslova Bosne i Hercegovine. 2001. Archived from the original on September 11, 2009. Retrieved December 19, 2009. ^ "Duma approves old Soviet anthem". CNN.com. CNN. December 8, 2000. Archived from the original on August 25, 2009. Retrieved December 19, 2009. ^ "Russian Duma Approves National Anthem Bill". People's Daily Online. People's Daily. December 8, 2000. Retrieved December 20, 2009. ^ "Guide to Russia – National Anthem of the Russian Federation". Russia Today. Strana.ru. September 18, 2002. Archived from the original on August 25, 2009. Retrieved December 20, 2009. ^ Shukshin, Andrei (November 30, 2000). "Putin Sings Praises of Old-New Russian Anthem". ABC News. American Broadcasting Company. p. 2. Retrieved December 18, 2009. ^ "State Insignia -The National Anthem". President of the Russian Federation. Archived from the original on August 10, 2011. Retrieved December 19, 2009. ^ "Russia Unveils New National Anthem Joining the Old Soviet Tune to the Older, Unsoviet God". The New York Times. December 31, 2000. Retrieved December 20, 2009. ^ a b "Duma approves Soviet anthem". BBC News. British Broadcasting Corporation. December 8, 2000. Retrieved December 19, 2009. ^ a b Blomfield, Adrian (April 26, 2007). "In death, Yeltsin scorns symbols of Soviet era". Telegraph.co.uk. Telegraph Media Group Limited. Retrieved December 19, 2009. ^ Embassy of the USSR (1945). "Last Honors Paid Marshal Shaposhnikov". USSR Information Bulletin. Embassy of the Union of the Soviet Socialist Republics. 5: 5. Retrieved December 19, 2009. ^ Studies, Joint Committee on Slavic; Societies, American Council of Learned; ), Social Science Research Council (U.S.); Studies, American Association for the Advancement of Slavic (1984). "Andropov Is Buried at the Kremlin Wall". The Current Digest of the Soviet Press. American Association for the Advancement of Slavic Studies. 36 (7): 9. Retrieved December 19, 2009. ^ "Soviets: Ending an Era of Drift". Time. Time Magazine. March 25, 1985. p. 2. Retrieved December 19, 2009. ^ Berezovsky, Boris (May 15, 2007). "Why modern Russia is a state of denial". Telegraph.co.uk. Telegraph Media Group Limited. Retrieved December 19, 2009. ^ Osborn, Andrew (September 5, 2009). "Josef Stalin 'returns' to Moscow metro". Telegraph.co.uk. Telegraph Media Group Limited. Retrieved December 21, 2009. ^ a b "Notorious journalist backs up the idea to take out word "God" from Russian anthem". Interfax-Religion. Interfax. March 30, 2010. Retrieved April 2, 2010. ^ "God Beats Communists in Russian National Anthem". Komsomolskaya Pravda. PRAVDA.Ru. March 30, 2010. Retrieved May 12, 2010. 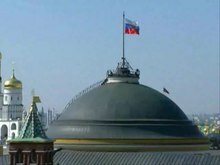 ^ "Russia marks Victory Day with parade on Red Square". People's Daily. People's Daily Online. May 9, 2005. Retrieved December 20, 2009. ^ Музыкальная редакция: Государственного гимна Российской Федерации [Musical Notation — National Anthem of the Russian Federation] (in Russian). Government of the Russian Federation. 2000. Retrieved January 18, 2010. Graubard, Stephen (1998). "Ethnic National in the Russian Federation". A New Europe for the Old?. Transaction Publishers. 126 (3). ISBN 0-7658-0465-4. Retrieved December 19, 2009. Ioffe, Olimpiad Solomonovich (1988). "Chapter IV: Law of Creative Activity". Soviet Civil Law. BRILL. 36 (36). ISBN 90-247-3676-5. Retrieved December 18, 2009. 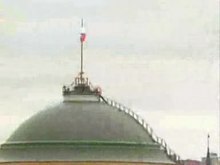 "The Patriotic Song" was the national anthem of Russia from 1991 to 2000. It was previously the regional anthem of the Russian SFSR from 1990 until 1991, when its successor state the Russian Federation was constituted. Unlike most national anthems, it had no official lyrics. The State Anthem of the USSR, also unofficially known as "Slav'sya, Otechestvo nashe svobodnoye" was the official national anthem of the Union of Soviet Socialist Republics (USSR) and the state anthem of the Russian Soviet Federative Socialist Republic from 1944 to 1991, replacing "The Internationale". The lyrics were written by Sergey Mikhalkov (1913–2009) in collaboration with Gabriel El-Registan (1899–1945) and the music was composed by Alexander Alexandrov (1883–1946). Although the USSR was dissolved in December 1991, the melody of the anthem continues to be used in the State Anthem of the Russian Federation, which has different lyrics from the version used in the USSR. Sergey Vladimirovich Mikhalkov was a Soviet and Russian author of children's books and satirical fables who had the opportunity to write the lyrics of his country's national anthem on three different occasions, spanning almost 60 years. Alexander Vasilyevich Alexandrov was a Russian Soviet composer, the founder of the Alexandrov Ensemble, who wrote the music for the State Anthem of the Soviet Union, which, in 2000, became the national anthem of Russia. During his career, he also worked as a professor of the Moscow State Conservatory, and became a Doctor of Arts. His work was recognized by the awards of the title of People's Artist of the USSR and the Stalin Prize. Eswatini–Russia relations are the bilateral relations between the nations of Eswatini and Russia.